Over the last decade, the Philippines has ranked among the top five most disaster-hit countries, according to the Center for Research on the Epidemiology of Disasters, or CRED. This tropical archipelago of more than 7,000 islands is located along a typhoon belt, with an average of eight to nine tropical cyclones making landfall in the country each year. In November 2013, super typhoon Yolanda (international name: Haiyan) hit this country claiming more than 6,000 lives and leaving thousands more homeless and without livelihood. 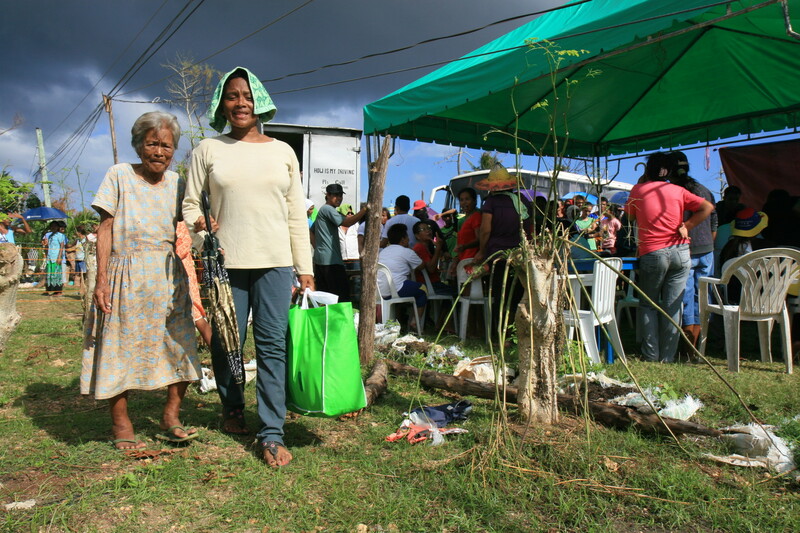 In a poverty-stricken country, in the midst of disasters, women face even greater problems. A study published by SEARCA shows that women are more vulnerable to disasters due to their lack of access to resources, diversity of income sources, and differences in the relative social status. Melanie Reyes, Program Coordinator of the Women and Gender Institute (WAGI), an academic-based advocacy center promoting women’s empowerment at Miriam College in Quezon City, agrees with the assessment that disasters have an increasingly negative impact on already vulnerable populations. “During natural disasters like typhoons and floods, often more women die than men because they are not warned, cannot swim or cannot leave the house alone,” says Reyes. “Women are often less mobile, more likely to confined to the house and have less decision-making power, after a disaster hits. In many societies, household chores and caregiving responsibilities — like taking care of the children, the sick, elderly, the home, and protecting household assets — prevent women from migrating to look for shelter and work when a disaster hits. Self-sacrifice even hampers women’s own rescue in any type of disaster,” Reyes tells Women Across Frontiers. Herald Postero 85 lost everything in Typhoon Haiyan. 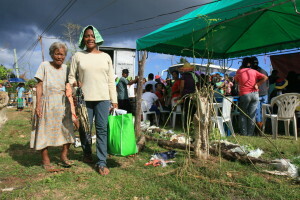 Her granddaughter Marietta l Postero helped her through the process of registration to receive emergency hygiene kits. Organizations like WAGI, believe that there is a need for gender-inclusive disaster risk management to deal with the hazards of disasters brought about by climate change. One agency working towards making disaster risk management more gender-inclusive is Oxfam, an international non-governmental organization. “Whenever you talk about emergencies and disasters, it’s the men who are the ones most visible on the field as first responders and deployed in the field as lifesavers. Women are often seen as victims or the ones who need saving,” Lyons tells Women Across Frontiers. One of Oxfam’s programs is called WIRED, which stands for Women’s Increased Resilience and Empowered against Disasters. WIRED works with women in disaster-prone areas, teaches them leadership and lives skills and the resilience needed in times of disasters. The program has been running for the past year in 10 barangays (villages) in Salcedo, a coastal town in Eastern Samar in the Philippines, an area frequently hit by typhoons. “It’s ironic that in fishing communities, many women still don’t know how to swim,” says Lyons. Typically men are the ones who go out to sea, while the women stay at home and take care of children and the household, negating the need for women to learn how to swim. “With the help of organizations like Red Cross, we equip women with basic life skills like swimming, first responder training, rescue, CPR, first aid and even how to operate lifeboats,” explains Lyons. Oxfam believes that enabling women with skills and giving them direct responsibilities to be involved in rescue operations, lifesaving or emergency response teams, could make the difference between life and death. “This gives them the capability to save themselves and help others,” assures Lyons. The youth are another sector that goes overlooked, so Oxfam makes sure to involve young women in activities, as they have the energy and willingness to help out. “We always include young women in the community in first responder training. In one village, we were even able to empower the first woman leader to serve as Municipal Disaster Risk Reduction and Management Officer,” says Lyons. According to Lyons, there’s often some resistance when women become political leaders in their community. “When she got in, she was questioned on whether she could even swim. But the fact is that she was a scuba diver and was very capable of holding that position,” adds Lyons. Another important aspect of rebuilding is considering women’s special needs after a disaster strikes. Studies show that after super typhoon Haiyan struck the Philippines in 2013, more than 3.5 million women and girls were affected, 250,000 of whom were pregnant and 169,000 were breastfeeding. Almost 40 percent of village healthcare centers and four government hospitals in one region were destroyed leaving pregnant women to deliver babies in often unsanitary conditions. 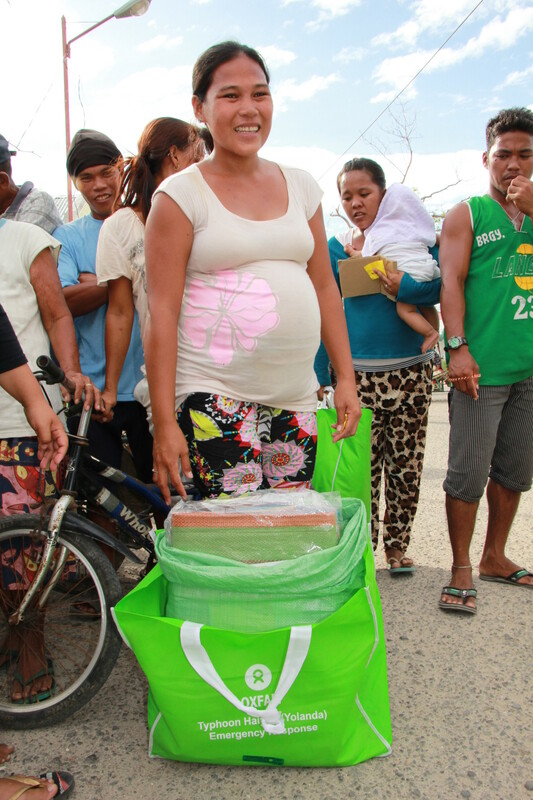 Oxfam aims to address the specific needs of women in relief distribution. The organization has developed women-specific hygiene kits for pregnant and breastfeeding women and plan to launch “baby boxes” for new mothers. “Oftentimes, mass relief operations overlook that women still get their periods or can get pregnant and give birth in times of disasters. During our consultations with women in the community, they asked that we include items like manzanilla (an oil for stomach pains) and sanitary or maternity napkins in the family survival kits,” says Lyons. One item that they also include is a malong, a traditional tube skirt that can be used as a blanket, skirt, baby hammock/sling and even provide privacy while changing clothes, to give women some coverage in crowded evacuation centers. Yet the most important tool for reducing casualties in communities is getting information out in a timely manner through early warning systems. The Philippine Government has developed a disaster early warning system called Project NOAH (Nationwide Operational Assessment of Hazards) that gives the public access to accurate, reliable, relevant, and timely hazard and risk information in times of disasters. “We believe that increased risk awareness is key in cultivating a culture of preparedness and reducing the catastrophic impacts of extreme hazard events,” says Irene Picache, a Senior Science Research Specialist of Project NOAH. Project NOAH relies on computer-based simulation project hazard maps that reflect flood-prone areas at a local scale or community level. They provide a forecast map and list of areas that could experience rainfall greater than 100 millimeters of rain in 24 hours. In the meantime, for remote areas without electricity or those that suffer from power outages during times of disasters, the best solution still relies on community-based monitoring. The team behind Project NOAH collaborates with various agencies to develop localized disaster management solutions to promote safety from natural hazards. “In some communities where there’s a cellphone signal, they rely on text message blasts to warn people when it’s time to evacuate an area. In other remote communities, it could be as crude as someone going around with a megaphone,” says Lyons. Oxfam also works with community leaders to translate early warning systems into something relevant to the community and determine how this can be used to prioritize women’s needs and involvement. According to Lyons, what’s important is that the community, particularly women, are involved in the designing the early warning system and disaster plans and put in place as community leaders. “By empowering women as leaders and getting them involved, we reduce their vulnerability,” says Lyons.